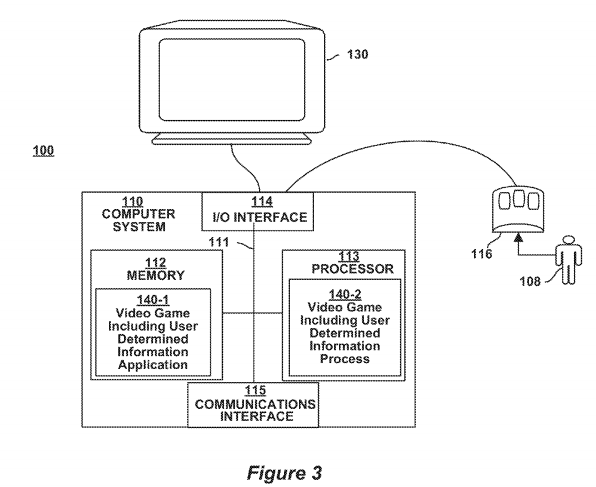 The ‘087 patent covers a method and device, which work together to collect player selected GPS information then use that information in the creation of some elements of a game world. The created elements may be derived from real world video or from other stored information. The game world is mapped over the selected GPS location. 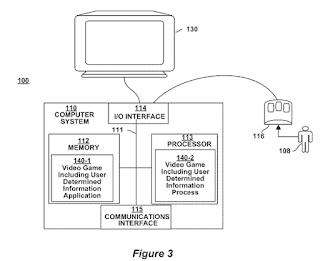 A method, apparatus and computer program product for a video game including user determined location information is presented. Location information (e.g. GPS, Google Maps, an entered address or the like) determined by a user of a video game is acquired. Then user determined location information relating to a physical location determined by the user is mapped to a video game environment wherein the user of the video game experiences objects from the users entered location while playing the video game. mapping said user determined location information into a video game environment wherein the user of said video game experiences objects from the entered real world physical location, wherein said user traverses said video game environment while playing said video game, wherein said user of said video game is stationary in said real world and wherein all images acquired from said continuous pre-recorded actual video remains exactly as presented in the real physical world into the video game.